More Light by Bryony Lavery was written in 1997 for the BT Connections project to provide youth theatre plays written by writers who wrote primarily for adult professional actors and for adult audiences. If I am not mistaken More Light was commissioned in the very first batch of these plays. The story begins when a group of Emperor’s concubines are buried with the Emperor, because they have not borne him any sons. They then seek to survive in the tomb by eating him and many of the other artists and architects buried in the tomb with them. When we add to this that the play involves mutilation, discussion of abuse, murder and is richly laden with images, imagination and poetry which explore society, art and patriarchy, it seems like a tricky ask for a youth theatre to perform. When I decided to use this play for our 10 week Core Performance course in Chekhov and Ensemble techniques I thought it was challenging for adults. In our case doîng the play with a smaller number of actors rather than a twenty strong youth theatre has provided challenges but as always, also provides many strengths. For instance two of our adult actors are playing small children. Bryony Lavery beautifully explores conventions of oriental literature and theatre to provide us with a theatrical language for this play, yet at the same time I think it is very important to widen the play from an exploration of any particular racial group. The degradation and exploitation of women in the way we see it in More Light exists within many groups, so for instance our high oriental shoes are actually modern high heels sprayed gold. In a way, More Light has a lot of similarities with Golding’s Lord of The Flies in which a group of shipwrecked schoolboys build their society upon the public school system only to reveal that there is something feral and incredibly violent underneath their polite and rigid system. 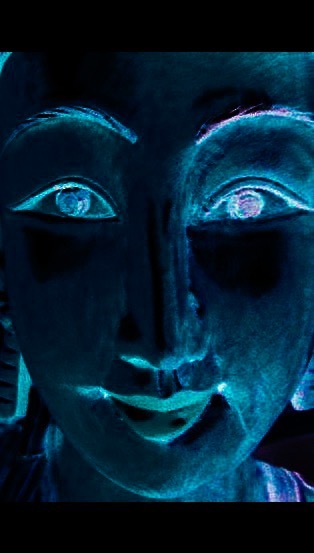 In More Light the women are locked in a tomb , resorting to violence in order to survive, but from that, creating a society and an art that is beautiful and different to the harsh Art of their Emperor. However, in order to make their society and their art, they still have to eat human flesh. This is their dilemma. In our contemporary world, it reminds me of how we frequently buy unethically produced products, made by people with poor living standards and even endangering the workers that make them .How often do we put this to the back of our minds so we can get on with our lives, feed our children , express our creativity? Galway has actually seen a production of this play before in 1998 performed by Galway Youth Theatre , and it was performed in Nuns Island Arts Centre directed by Selena Kelly . We perform it there too. I loved the play then and resolved that at some point I would like to direct it. 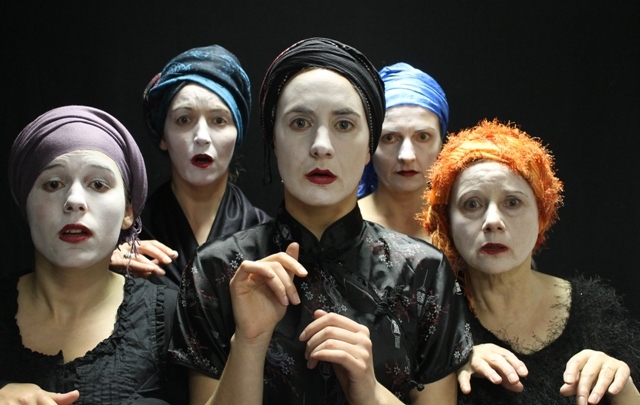 ‘More Light’ by Bryony Lavery plays at Nuns Island Arts Centre Galway from the 14th – 16th May telephone 091 565886. 8 pm start. The play performed by Core T.C. runs for 60 minutes. This entry was posted in Uncategorized and tagged Bryony Lavery, Core Theatre College, Galway performance, More Light on April 25, 2015 by maxhafler. Beginning serious work on a play is for me like jumping into the ocean. You have to be alive and awake to the currents and yet at the same time find your own way. Your way is not only influenced by the writer’s imagination – in this case a spectacular flight of the imagination – the actors’ imagination, the design team etc, but something else, something intangible. Michael Chekhov says that as artists we ” make the intangible, tangible” I love this idea; that something completely unique and unknowable comes from this process, dependent on every single member of the creative team and their alchemical contact with each other , with the characters and the score that is the play. As a director I have to be open and yet focused. It is like living in a dream sporadically through the day. The students on the Current Core Performance course and I are about to embark on the short play More Light by Bryony Lavery .We are working mainly with Chekhov Technique to produce this work. The play depicts an ancient empire where the Emperor is God. He arranges for a tomb to be built and all the artists and craftsmen who build it are left to die with the Emperor in the tomb. Along with the emperor are the concubines who have not borne him sons. They are expected to tend him, serve him – and die with him. Left in this terrible position the women take a momentous decision. The world they create is like a crucible for the imagination, not without its terrible compromises and polarities but one in which the women for a while at least survive and thrive. Bryony Lavery constantly describes impossible stage images which only the most well funded company might produce but nonetheless her images make you gasp at her vision when you read them. Her vision is little short of audacious. The images are an important part of the fabric supporting one of the most important themes of the play, the place of Art and imagination in our lives. It seems to me now that we are going to mime many of these impossible images or create them with sound – in other words we are asking the audience to engage their imaginations as much as the writer and the creative team have done, in bringing this play to performance; that it will be a truly collaborative piece of work for the audience as well as for us. Only then will creating many of these extraordinary images, like the flying flock of origami birds become possible. Anyone who has seen a real origami bird knows they are, disappointingly, quite heavy ! So simplicity will be the key. Simplicity in fact is a liberating force. Simplicity and Imagination encourages magic in a way that literal presentation can hardly ever do. This of course does not mean that you eschew the visual aspect, in fact ironically, by simplifying , you can often enhance it. As Peter Brook said in a recent interview, ‘simplicity is not a style’ . You might check this deeply inspiring interview out on http://www.youtube.com/watch?v=Sx2qHHFS5Yk if you have not seen/heard it. This entry was posted in Uncategorized and tagged Bryony Lavery, Chekhov Technique, Core Theatre College, Imagination, More Light, Peter Brook on March 24, 2015 by maxhafler.